Coffee Pointe in Savannah, Georgia is a 55+ active adult community being built by D.R. Horton. It is located alongside an existing community also named Coffee Pointe that is not age-restricted. The 55+ section of Coffee Pointe will offer four different floor plans all with one-story living layouts. This resort-inspired community is near many daily conveniences and has many amenities that every active adult can enjoy. 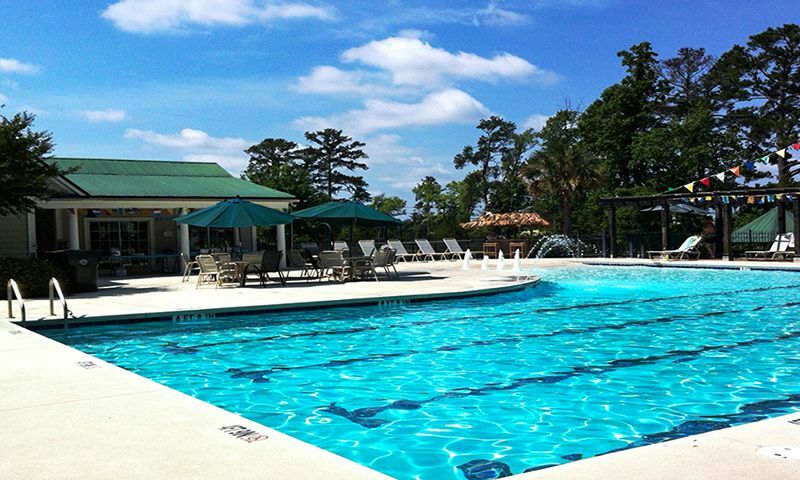 The amenities in Coffee Pointe are not age-restricted; they are available to all residents. The clubhouse is located on the edge of the community’s marsh. Inside, residents looking to stay in shape enjoy a fitness center. There is also a gathering room for 55+ active adults to enjoy spending time with neighbors and friends. Outside, there is a swimming pool and patio with a gazebo for homeowners to enjoy. There are also walking and biking trails that provide scenic views of the many parks, natural spaces, and scenic ponds in Coffee Pointe. When your grandkids come to visit, there is a tot lot for them to play on. D.R. Horton began construction on Coffee Pointe in 2017 and plans to include just 45 homes upon completion. These floor plans will range in size from 1,588 to 1,883 square feet and include two bedrooms, two bathrooms, and an attached two-car garage. These detached residences feature energy-efficient designs, one-story living, open layouts, gourmet kitchens, elegant master suites, inviting living and dining rooms, flex rooms, and optional second-floor bonus rooms. Homeowners at Coffee Pointe will live a truly resort-inspired lifestyle. With access to amenities, clubs, and activities, residents will always have lots to do. In addition to the clubhouse where you will plan events and start new clubs, a homeowners' association will ensure that you spend your time picking up new hobbies and exploring new interests while they take care of things like mowing the lawn and shoveling snow. Coffee Pointe offers residents a wonderful low-maintenance lifestyle and plenty of activities to enjoy. Just an eight-minute drive from Coffee Pointe are a Home Depot, Publix Super Market, Applebee’s, PetSmart, and many other restaurants and daily conveniences. Interstate 95 is also nearby, making getting around Georgia a breeze. Just 20 minutes from the community is downtown Savannah. There, residents will find such attractions like the Jepson Center for the Arts, SCAD Museum of Art, and Georgia State Railroad Museum. Also located downtown is Forsyth Park, a 30-acre park with basketball and tennis courts, as well as walking and biking paths and a large, historic fountain. St. Joseph’s Hospital is only an eleven-minute drive away from the community. When traveling farther is needed, Savannah Hilton Head International Airport can be reached in about 30 minutes. No matter what you like to do, there is something for everyone near Coffee Pointe in Chatham county. Check back soon for more information on the lifestyle in Coffee Pointe. Had a chance to drive through here and was really excited to see what was going on. The location is amazing. I love the quiet area and Savannah is so easy to get around that you're anywhere you need to be in minutes. Looks like it will turn out to be a nice place to live. 55places.com is not affiliated with the developer(s) or homeowners association of Coffee Pointe. The information you submit is distributed to a 55places.com Partner Agent, who is a licensed real estate agent. The information regarding Coffee Pointe has not been verified or approved by the developer or homeowners association. Please verify all information prior to purchasing. 55places.com is not responsible for any errors regarding the information displayed on this website.